Lemon curd is a must at a proper afternoon tea. You can have clotted cream, either raspberry or strawberry jam, plain or fruited scones (even gluten-free scones); but if you don't have lemon curd, well, oh dear, I just might get a sudden headache and have to go home. Mixing it up in the food processor is a breeze. If you don't have a food processor, use a very fine grater to grate the lemon zest and then use a mortar and pestle to grind it into oblivion with a bit of the sugar and a mixer to mix everything up before cooking. Of course, if you want perfectly smooth curd without even the tiniest flecks of peel you'll need to strain it before it goes into the jars. And if you're going to strain it, you don't need to be quite so vigorous in your efforts with the zest. But I happen to love the tiny bits (so tiny as to be invisible, but you can feel them on your tongue). Meyer lemons are my favorite, but if they aren't available in your area or at the time of year you're making this, just use regular lemons and perhaps as much as an extra 1/2 cup of sugar. That's what I'll be doing once I can no longer get the Meyers. Especially since you'll be using the outer peel, it is best to use organic or unsprayed and unwaxed lemons. I used to make my curd with 8 egg yolks, then at some point I decided to just try it with whole eggs. I love it! And there's no worry about having to find a way to use 8 egg whites within a day or two so they don't go to waste. There are times when I just don't want to make a pavlova or angel food cake; all I want is a couple of scones with a spoonful of lemon curd. Tell me, do you love lemon curd? What do you use it for? 1 Have ready 3 half-pint jars or 5 quarter-pint jars (6, if you're using regular lemons and the added sugar). Using a vegetable peeler, remove the zest of 3 lemons. Squeeze and strain the lemons, using the fourth lemon if needed, to get 1/2 cup of juice. 2 In work bowl of food processor, process the zest with the sugar, cornstarch and salt until the zest is extremely finely minced (it disappears), about 30 seconds. Add the softened butter to the work bowl; process until mixed well, about 15 seconds. Add the eggs to the work bowl; process for 10 seconds. 3 Scrape the mixture into a heavy-bottomed 2-quart saucepan (I use the Le Creuset stainless steel 2-quart saucier) and stir in the lemon juice. Cook over low heat, stirring constantly with a silicone spatula, until mixture is thickened and coats the spatula (and when you run a finger across it, it leaves a track). It should register 165F/74C on an instant-read thermometer. This will likely take about 10 minutes; do not boil. 4 Pour into 3 half-pint jars (one will be just partially filled) or 5 quarter-pint jars. Refrigerate for several hours before using and for up to 2 weeks. For longer storage, freeze for up to 3 months. Jessica, you can still try it with regular lemons. It will just require more sugar. But if you can get your hands on some Meyers, I think you're really going to like it! This reminds me that I haven't made lemon curd in a really long while. Your lemon curd has such a smooth texture..beautiful! Angie, thank you. I love a nice smooth curd. I love lemon curd in those tiny tarts with a berry on top. 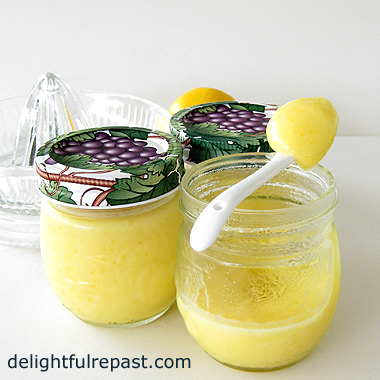 I made King Arthur's microwave lemon curd recipe, but I'd love to try yours. Let's sit down together and I'll bring some scones over, and we can slather on your lemon curd, and share a cup tea. Sound good?? I think so! I have never made lemon cure. Can you believe it? Pinned and shared to #ThursdayFavoriteThings! Pretty girl, what a great home made lemon curd recipe, so smooth looking, I love it! I will soon try it and let you know! I love your idea too with the scones. Thank you for your fun visit, I appreciated it sweetie. Ohhh, Kitty, yes, that does sound good! Would love that! Oh... I just followed your blog too. Marilyn, I think a lot of people have never made it. Hope you'll try it soon! I love lemon curd but like others, have never made it. For those of us who are not fans of too-sweet things, it seems to strike a lovely balance. My preferred use for it is simply on toast, but I might pop it on a scone too. Thank you, Jean - wonderful post! Have never been introduced to lemon curd (…how do you do, Lemon Curd?). At least not knowingly. Could be it was at some classy event that I dragged my classless self to. In any case, I’m flying blind but will not hesitate to award 5 cleavers to this concoction. It is much too close to lemon meringue pie to be anything but 5 cleavers! 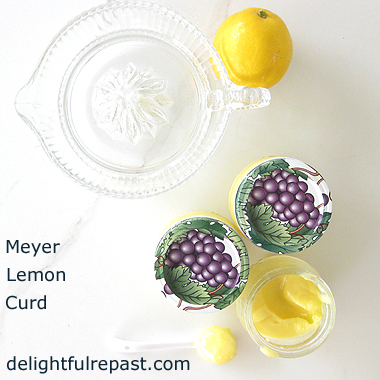 Lemon curd – yum, yum! Fabby, thank you (and thank you for pinning -- much appreciated!). I hope you will try it soon, and do let me know how it turned out for you. Try the clotted cream, too! Fabby, thank you for following! I really appreciate it and look forward to visiting your blog regularly. Pauline, I'm glad you liked the post! I'll have to try some of the curd on toast as I never have before. Sully, I had a feeling this one might earn your coveted 5 Cleavers award due to its similarity to lemon meringue pie! Yes, you could call this lemon pie without that pesky crust and meringue! I LOVE homemade lemon curd and haven't made it in a very long while. I host (well used to much more often) tea parties and I have a couple tea society sisters who absolutely love good lemon curd. I think it is time to make some more, and will try your recipe too. Thank you for sharing! It looks so delicious! Oh, I so love lemon curd, but I've never made it with whole eggs, I want to try it, thank you dearest Jean for another wonderful recipe of yours ! Michele, thank you! I hope you will try it soon and let me know how it turned out for you. I made this batch for a tea party in a couple days. Can't wait! Thank you, dear Dany. I hope you like it as much as we do. Hope you are having a wonderful spring. Oh I love lemon curd. I have never made it myself though. This sounds easy. It really is, Charlene. I hope you'll try it soon. I love lemon curd and home made is always best. Thank you for sharing your recipe. Yum! Enjoy your weekend, Jean. Thanks, Sandi! Have a great weekend! Hi Jean! Oh, YUM! I love lemon curd. Your recipe looks perfect! Karen, thank you! I love it and hope lots of readers will make it and enjoy it as much as we do. You have made me so hungry! Wishing you a nice upcoming weekend. Thank you! I was just thinking about you this morning, Mildred. Glad you stopped in so I can find your blog now. All I could remember was your old blog name! I canned this once and I think it might be time to do so again! Delicious. Thanks for sharing and linking and Happy Tea Time! Thanks, Bernideen! I decided I'm afraid of canning it, but I'm sure your canning skills are more advanced than mine. I have thought of freezing it though. I'll let you know how that turns out. Homemade curd is divine. I've only made it once and made lime. Thanks for this recipe. You are welcome, Lea Ann. Lime is wonderful, too; but the Meyer lemon is my fave! Thank you, Cheryl! I hope you'll love this lemon curd! Mmmm.. I was just thinking that your lemond curd would be delicious on scones :) Thanks for sharing your tasty recipe. dear Jean. Hi Jean -- a couple of things here! First, since I can't reply to your blogger comments by email, thanks for coming by the Marmelade Gypsy. I wish I'd had your lemon curd recipe when making that lemon meringue cake. In fact, I'd be whipping it up today for a tea tomorrow but I have six yolks I need to do something with and not sure if it would work without the full egg. If I had time to experiment I'd give it a shot but I'm not that sure about egg chemistry! But this looks delish and usually I don't have spare egg yolks hanging around (the mousse was the culprit!) So sooner or later here, I'll be giving it a try. I find life without lemon curd is dull indeed! And I have some awesome scones to put it on! Your sweatshirts -- Go Blue is U of M (the maise-and-blue school down the road, but I have OK feelings as The Kid went there); MSU (my alma mater) is green and whiite! So if you were wearing MSU shirts, that Go Blue was an insult! And if you are wearing navy/gold shirts, a reference of camaraderie! Thanks! Sorry, Jeanie, yes, it was U of M. I always get that confused! I do hope you'll get a chance to try this curd soon (thus ending having another thing that leaves you wondering what to do with all those rest-of-the-eggs!). Jean, back in the 1950's and onwards through the 60s and 70s when I eventually left the nest, in Southampton where I was born and brought up, my mum made me and my brothers lemon curd. She put it into recycled jam jars and we ate it, spread on top of bread and butter and often on toast. You have brought back memories!!!!! Tony, thank you so much for sharing that memory with me! How fun! I love it so much I have a hard time not just eating it straight out of the jar! I love that your recipe uses whole eggs. I never seem to be able to get around to using my leftover egg whites. Thanks, Gerlinde. I know what you mean! I've never actually had lemon curd. Maybe it's not common north of the border? I don't know how I ever mistook the teapot for purple. Hee! Margie, up until recent years it wasn't common south of the border either! It's a British thing, so it's very common in Canadian places like Victoria BC. Like anyone with any sense , I love this stuff (it's been traditionally called 'lemon butter' in most of Australia, but that's changing) . BUT I AM ALLERGIC TO LEMONS. It's been torture to read this and look at the photos. I actually JUST made lemon curd!! I put it on vanilla cake, and it was so good!! Yours looks amazing! Cathleen, thank you. It IS wonderful on vanilla cake, isn't it! I just served it, and my homemade clotted cream, with scones at a tea at my friend's house this afternoon. Everyone loved both. We love lemon curd and will definitely be trying your "whole egg" recipe the next time I make it. We don't seem to have Meyer Lemons here - ever. But I will have to check around and see if they might be here seasonally. Thanks for all the tips! Our favorite way to enjoy it is on fresh, hot scones. We had this for Easter this year for dessert! The curd tasted like "Spring on a Spoon"! You had me at Meyer lemon. Lily, thank you! Did you not know you are the winner for the Wusthof knife giveaway? You did not include your email address in your comment, so I have no way to contact you; but the announcement is in the comment section of that post. I hope to hear from you before midnight Eastern time Sunday (just 15 hours from now), at which time I'll have to select another winner. Art and Sand, thank you for hosting SYC. There's nothing quite like a Meyer lemon. Your post is featured today on my Special Featured Blogs from Monday's party! Congratulations. Thanks, Bernideen! I'm heading over there now! Thank you, David. I hope you will let me know how it turns out for you. I made a batch for a tea party yesterday, and everyone loved it. Hi Jean! No, I didn't know I had won. I had thought the drawing for the knife was a little later for some reason and was going to check soon! This is the one giveaway I have entered that I really, really wanted to win. And it is the only one I have! I am actually at tears because this has been an incredibly difficult week and now something so nice has happened. Thank you. I love lemon curd and usually buy jars of it which are expensive but you make the recipe appear so easy Jean, I'm going to give it a go. Perfect on a scone or next best - crumpets. Some lemon tarts would be nice as well! Judith, I hope you will give it a go soon. It is so much less expensive than storebought *and* so much fresher tasting. I am sooo in the mood for some tiny lemon tarts now that you mention them! Oh yum Jean! I have never made my own lemon curd. It looks absolutely delicious! Thanks for sharing the recipe with SYC. Jann, I think you'll be surprised at how easy it is and how much better it is! Back atcha with the hugs! Yum, I could eat spoonfuls of this! 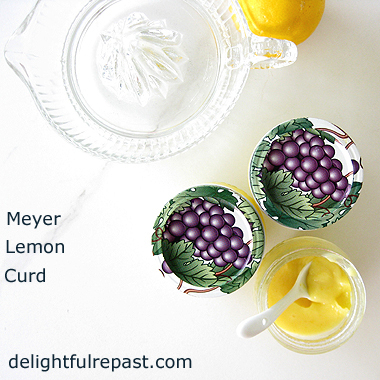 I love lemon curd ever since my second pregnancy, where I had lots of lemon pie cravings and made lemon curd. It's so delicious, but I haven't made any in a long time actually! Pinned! Katrin, isn't it wonderful to have something so much easier and faster than pie to satisfy your lemon pie cravings?! Thanks for Pinning, too; much appreciated! Jean, thank you for visiting my little blog. So very nice to meet you. I have never made lemon curd but I am thinking that will change soon! Thank you for sharing your recipe with us! Thanks, Gina! Do let me know how it turns out for you. Or if you have any questions about it. Thank you for visiting my little space! Your comment led me back here, and I am so glad! Billie Jo, thank you so much! You just made my morning! Congratulations! Your post was my feature pick from my Commenters at #ThursdayFavoriteThings this week. Visit me on Wednesday evening and to see your feature and grab you badge! I invite you to leave more links to be shared and commented upon. This sounds delicious! I've always wanted to try making a lemon curd, and have never gone through with it. With the surplus of eggs that I have right now, I think I need to make this! Marilyn, thank you so much! BRnLC, thanks! And, yes, I think it's a perfect way to use your surplus of eggs! We had it on cake tonight, and our guests loved it. I love lemon curd, Jean, but I've never made my own, partly because of the egg yolk thing. I love this recipe using whole eggs - and I'm definitely going to give it a try when I get home. I can't get Meyer lemons sadly but I know it will be delicious anyway. Lovely photographs! Pinned, and will be featuring your post at next week's hop. Thank you so much for sharing with us at the Hearth and Soul Hop! Thanks so much, April. Your Pins and shares are much appreciated. I am honored to be featured. Just remember that when you using regular lemons you'll likely need to use more sugar.